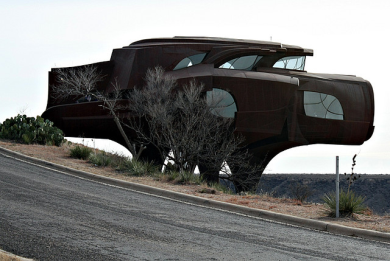 Artist and architect Robert Bruno commenced work on his steel home in Lubbock Texas in 1974 and at the time of his death in 2008, it was still a work in progress. Bruno had said that he wanted the structure to be somewhere between animal and machine and wasn’t too concerned about meeting timelines. His objective it seems was to create a living space that also served as an ever evolving work of art. Bruno himself was explicit about this and once said in a video interview that his motivation was to create something of aesthetic value and that having a house wasn’t of particular concern to him. He approached it as though he were creating a sculpture, working on the fly and making constant modifications. The four legs and cantilevered design curtail the structures impact on nature, causing far less disruption to the earth below than a conventional structure would have. Its estimated weight is 110 tons. On impulse, Bruno would tear down months of work creating a process that took as many steps backward as it did forward. After enduring decades of construction, friends and neighbours came to understand that finishing the project, was something that simply didn’t matter to him.